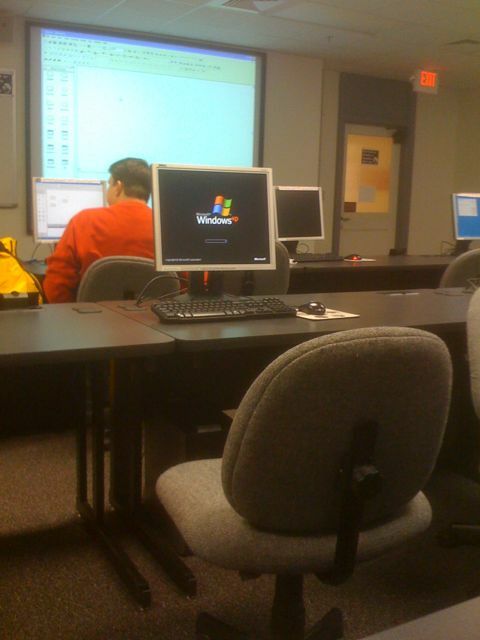 This computer gets as far as the Windows logo (pictured) and then reboots. It’s been doing this for the past hour, ever since class started. Over and over again. It was doing this during class on Monday as well, so this thing could have been going for 48 hours now. Once I’ve noticed it, I can’t stop staring at it! It’s driving me crazy, but I can’t really get up in the middle of class to turn it off. Dear. Lord. Somebody make it stop.